All purchases made by a business reflect in the GSTR-2A generated on the GST Portal. The details in this return are captured from the GSTR-1 filed by your sellers. A registered taxpayer is required to reconcile this GSTR-2A with their purchase invoices. The conversion of JSON file into Excel to be able to match and reconcile invoices with GSTR-2A is not required if you are using the ClearTax GST Software. The matching and reconciling is inbuilt in the software that makes your return filing process easier. Step 4 – Click on ‘DOWNLOAD’ button under GSTR 2A. Step 5 – Click on ‘GENERATE FILE’ and download the JSON file. Step 6 – Upload the JSON file and convert it to Excel format using a JSON to Excel converter available online. There you have it. Excel file ready for matching with purchase invoices. ClearTax GST Software will automatically compare the data and prepare the mismatch report. Matched – Invoices uploaded by you that match with the details uploaded by the suppliers can be seen here. Mismatch in Values – When you and your supplier both have provided the invoice details in the GST return but there is a difference in date, taxable value, tax amount, total invoice amount. Missing my Side OR Supplier Side -If the supplier has filed invoice and you have not included it in the return or vice-versa the mismatches are shown here. 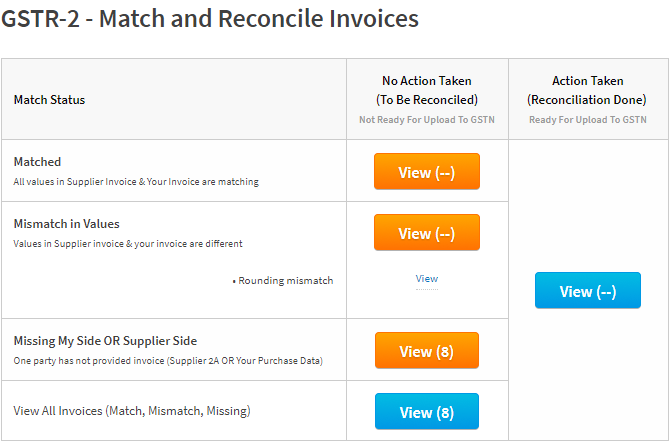 Also, any difference due to GSTIN mismatch, Invoice number mismatch is listed in this row. Matched invoices – You need to accept the values to claim ITC in your GSTR 2 return. Mismatched invoices – If you ‘Keep your values’ you will get provisional ITC. Full ITC is received if the Vendors values are accepted. ITC will not be claimed in the return if no action is taken in the reconciliation process. You can also reset the reconciliation changes if you think you have made a mistake. This is how you can use ClearTax GST software to easily reconcile and match invoices without having to download and convert the JSON file. ClearTax GST offers many such features that simplify your GST Billing and Filing process!